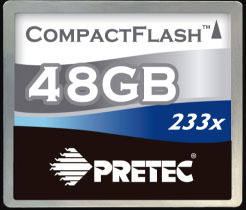 Pretec has announced some new compact flash memory cards that are the fastest and biggest on the marked today. The new cards have the ability to store a staggering 100GB and 64GB. These two cards are able to read and write data at 233X (35MB/s). Older card models from Pretec has also been updated with faster read and write speed. Their 32 GB and 50 GB compact flash cards now have 333X (50 MB/s) speed. The cards will start shipping this month. These type of cards are great when we see all the new cameras that are appearing on the marked. Many cameras now feature HD video and larger image sensors (like all the new FullFrame cameras appearing on the marked) that need CF cards with more capacity and faster read / write speed. If you are interested in finding good prices on memory cards you can check out a site called TestFreaks.com to compare prices from different webshops. Cologne, Germany, September 23rd , 2008 － Pretec, creator of the highest capacity CompactFlash card in the world (48GB) and the fastest CF card in the world (333X) will demonstrate even higher capacities including a 64GB CF card, in the Leaf booth (West Hall 4.2, B009) and CFA (Hall 5.1, G-019) at Photokina 2008. Continuing the revolution in the field of flash memory card speed and capacity, Pretec today releases 64GB and 100GB, 233X CF cards with access speed of up to 35MB/s, overtaking the Pretec 48GB CF card, the previous world’s record holder for highest capacity CF card; and super high speed 333X 32GB and 50GB CF cards capable of running up to 50 MB per second of Read/Write speed, the highest speed CF card in the world. Pretec CF 233X and 333X CF cards use metal housing and ruggedized construction to provide extensive ruggedness making the card resistant to impact and shock – at least 10 times more durable than a typical CF card. With the green concept of reuse, recycle and reduce in mind, Pretec 64GB CF cards can be configured or reused to make a 256GB SATA or IDE SSD, the highest capacity 2.5” SSD in the world so far, by using Pretec Q-SATA, a patent-pending technology of flexible, scalable and modular SATA/PATA design based on up to 4 CF cards. This technology provides ultimate flexibility and ease of use, especially for those needing both CF cards and SSDs. Pretec 233X and 333X CF cards will be demonstrated together with high performance digital cameras from Leaf, a business unit of Eastman Kodak and a world-renowned industry leader in providing cutting edge digital photography solutions, whose AFi professional camera was recently awarded “Product of the Year” at the Photoforum exhibition in Russia. The new Leaf AFi-II system delivers the fastest shooting speeds of any camera in its class, with a practically unlimited burst depth. Pretec 233X 64GB and 333X 32GB CF cards with suggested retail price of $399 and $630 are slated to start delivery by Photokina 2008, and 233X 100GB and 333X 50GB are expected to start shipping by the end of 2008.